The people have spoken, but should they? The most vicious critics aren't those employed to review a thing, they're the visitors and users of those things. Tripadvisor is a site where these thing-users can vent the built up, grump steam from their spleens and boy do they do it with gusto. 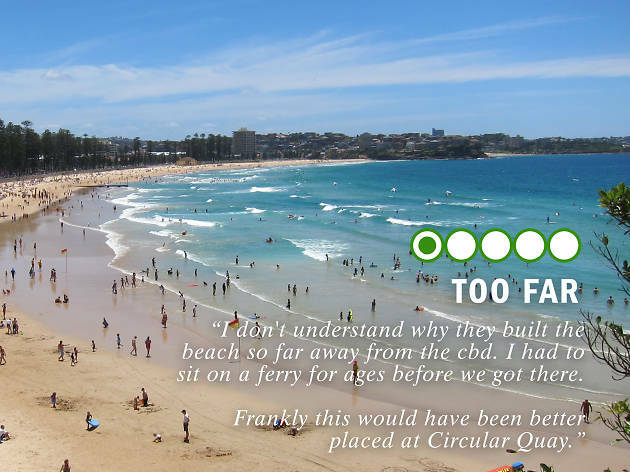 We trawled the reviews of Sydney attractions, landmarks, beaches, and events that many visitors felt earned a one star Tripadvisor "terrible" rating and found some absolute corkers. 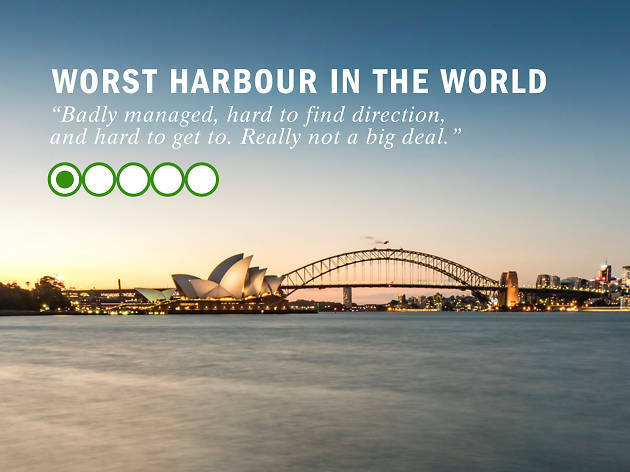 Lucky we still love you, Sydney, these people... don't so much. 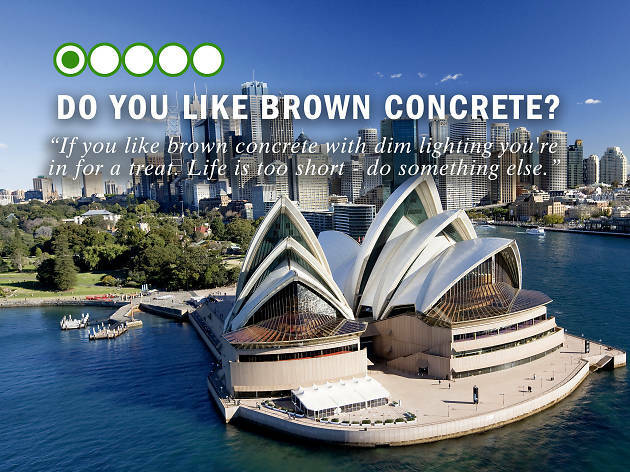 Read these then take a trip down memory lane with the 21 things we miss in Sydney. 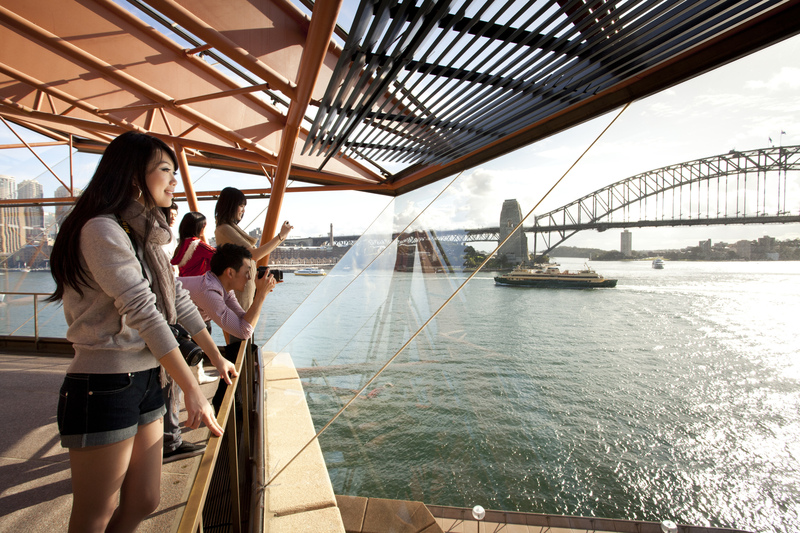 Refresh your love for our city by ticking off the 50 things to do in Sydney at least once in your life. 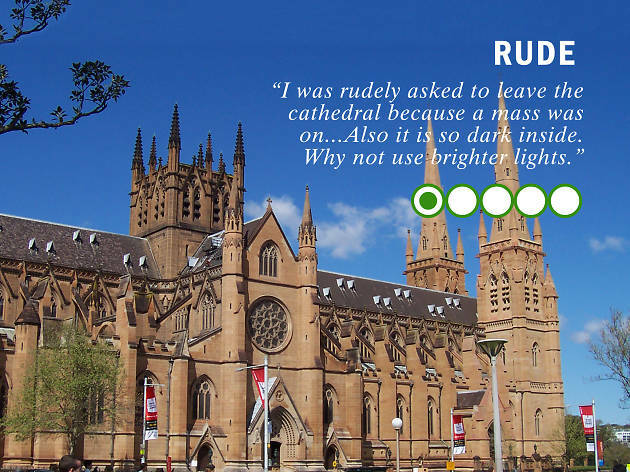 Firstly, this reviewer’s profile says they’re based in Melbourne so they’re obviously just steaming with hot jealousy. But we’re more caught up on the fact they find the harbour hard to find or access via public transport. It’s right there, all trains lead there in the end, you literally can’t miss it. 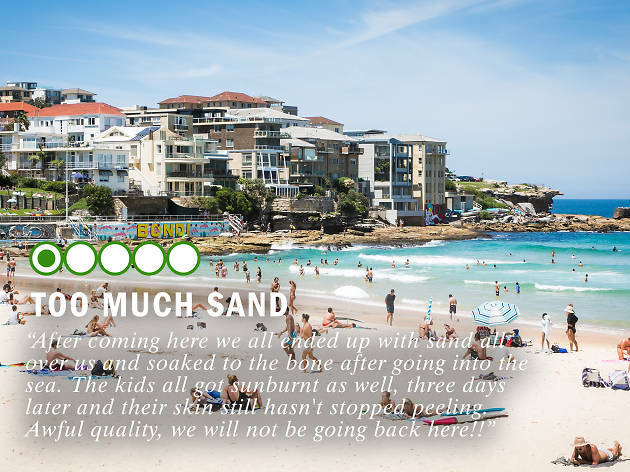 Reviewer, mate, we’re not all sand and wave fans, and Sydneysiders actually love a flat, sunbaking stretch out on that concrete so don’t yuck someone’s yum. 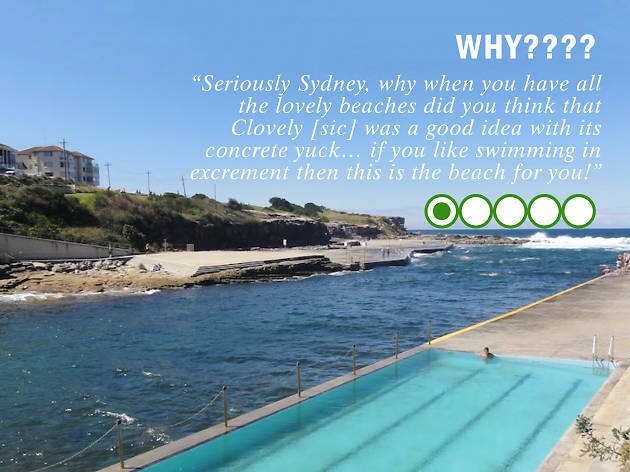 We also love swimming in excrement. Just kidding, whatever day you visited where people were gleefully diving in to poo water, we apologise on behalf of Clovelly on that day. “I saw the best art work of the day within the toilet bowl, the person ahead of me neglected to flush.” Bless. You say old stuff, dear reviewer, we call it historical relics of its past as a gaol (twice), shipbuilding yard, sandstone quarry, and fishing plateau for Indigenous Australians time immemorial. 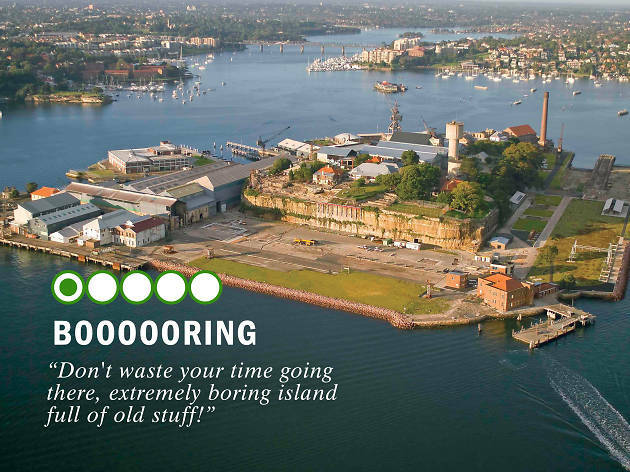 Actually, the rusty colonial, convict stuff IS boring, you’re right. If only the island had never been invaded by Europeans, now that would be interesting. We’re sorry to victim-blame this reviewer but if they didn’t want to encounter sociologists they shouldn’t have entered one of their notorious meeting points. Sociologists are deeply dangerous and move in packs, keep your distance if you don’t want to be sociologised at! Keep Sydney open? Keep Sydney sociologist free first! 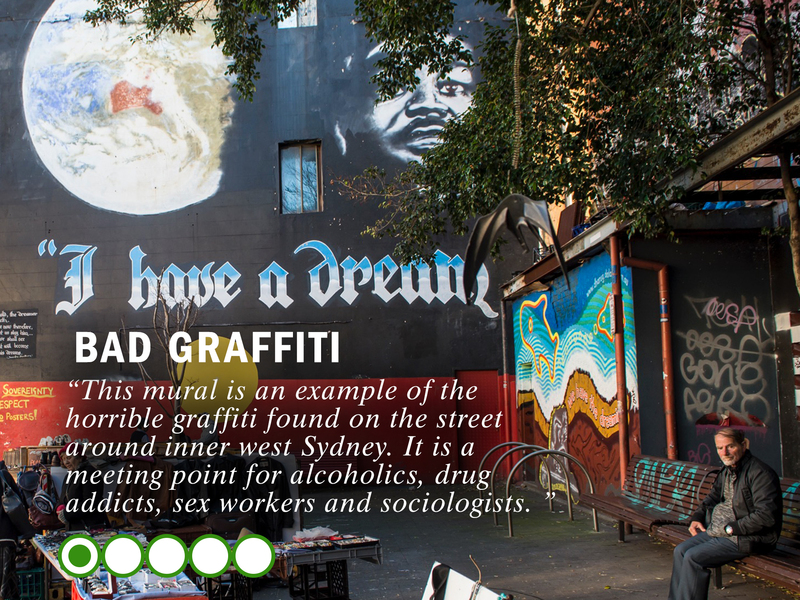 Time Out has to ask what this reviewer was wearing late at night near this Martin Luther King Jr mural, what did they expect? NO sociologists? That is a great pun. This reviewer gets ten points for eye-catching headline and melodic assonance. 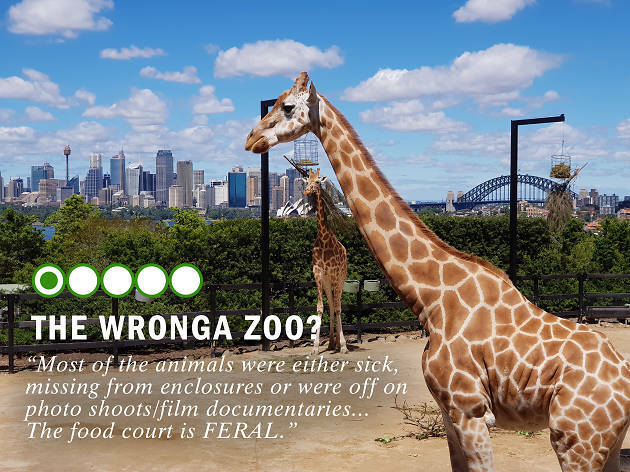 And, what a shame you visited Taronga on the one day the animals all had filming commitments. Ugh, another case of “the biz” pillaging the talent pool of Australia for Hollywood’s gain. Our animals are not your Hemsworths! What’s next? The giraffe playing truth or dare on Ellen? The koalas demanding that they will exclusively be photographed with Oprah and no one else (you should see their rider, entitled stoners). Even the food court made an appearance on ’90s fave The Ferals. Please, no more pictures, our tourists are missing out. For an able-bodied person the walk from Redfern Station to Carriageworks is nine minutes according to Google maps. 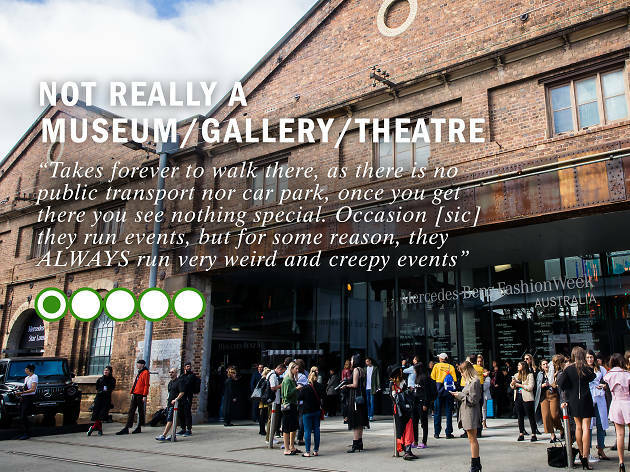 We think that whatever haunted house was occupying the building at the time of this reviewer’s visit really messed with their concept of time. The addition of “always”, however, suggests they have been weirded out on multiple occasions, perhaps the creepiness blinded them temporarily the second time and they missed the huge car park next to the building. Look, fair enough, parts of The Matrix were filmed there. Could not agree more. 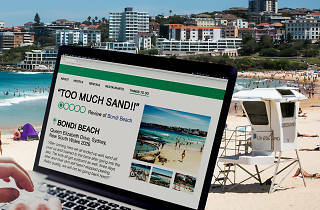 This reviewer should have been hired before we started on that pesky Westconnex, what a waste of time and money, those resources could have gone into building more centrally located beaches. This armchair urban planner has also got a point about all of that useless stuff taking up space at Circular Quay, we should bulldoze from the Opera House to Alan Jones’ house and make a beach. This guy is brilliant! 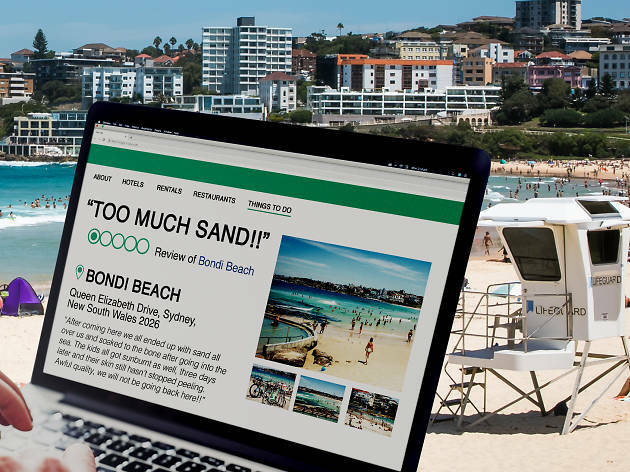 While we’re there, fill the ferries up with sand and cruise-ship style pools, that way you can ride on a beach on your way to the beach, imagine how much quicker that annoying ride to Manly would go if you were already sunbaking and splashing around. Genius! This is an excerpt from a very, very long read. 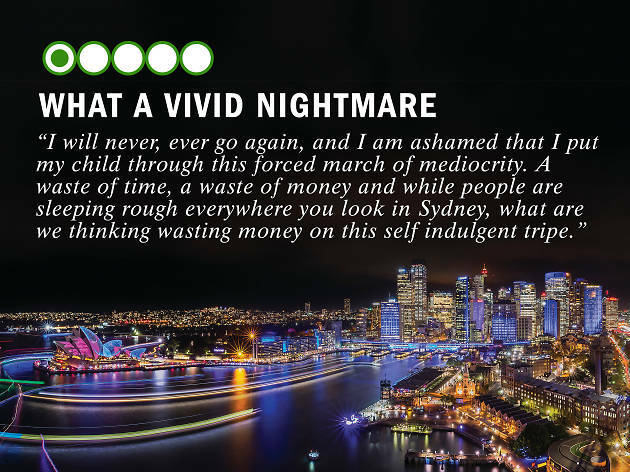 Click through to this reviewer’s tale if you’d like to read a thriller about Sydney’s transport system, the ways in which our infrastructure disruptions are horrifying when faced with large crowds, how limited quality food options are late at night in the city, and how gross and gauche the whole Vivid shebang is when people are suffering on the streets of our own city. It’s not really Vivid’s fault, but this reads like a dystopian nightmare and the fact that they have a wider socially-conscious perspective in the midst of all that privileged crowd crushing is admirable. 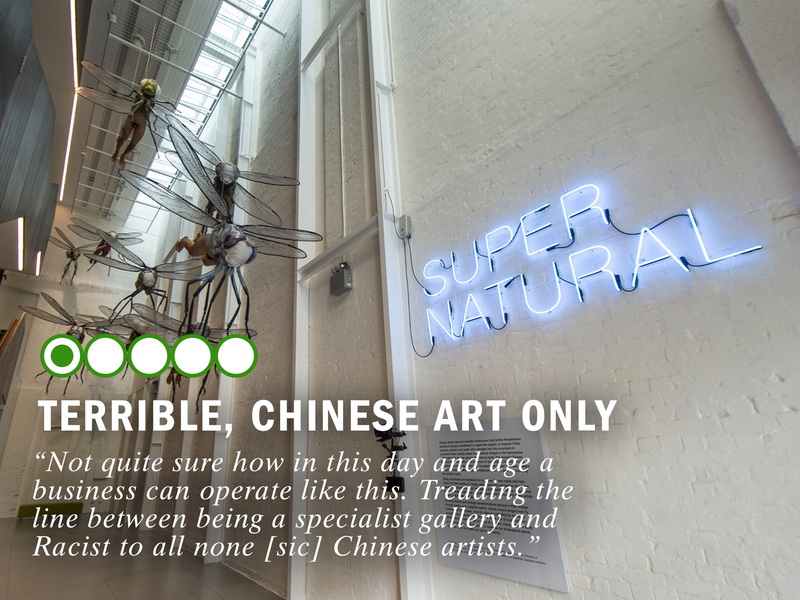 Hi reviewer, it is a private collection of Chinese contemporary art that is free to the public, which is wildly generous. The artworks are from that collection, so only from Chinese artists. That’s not racist, it’s a gift. Did you read beyond “White” in the name? Genuinely concerned, Time Out. P.S. You go on to say that you don’t know how a gallery that was “white anglos” only would be perceived if it existed. 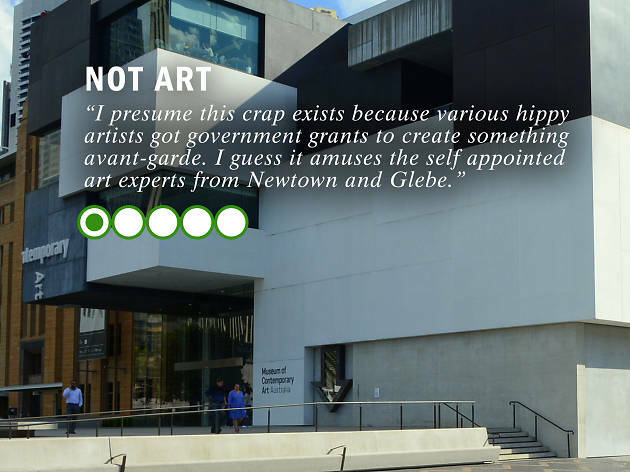 The answer is: all galleries, always, and they’re doing just fine. Carpe diem baby! Follow this reviewer’s lead and #livelaughlove like every day is your last! Ain’t nobody got time for brown concrete! Only visit an attraction if it is hewn from the finest marble and the lights are turned up to 11. Do not waste time on plebeian materials such as wood (vom), stone (spew), or tile (gross), nay, you shan’t be attending that tourist trap until you have to wear sunglasses from the extra bright lighting bouncing off the solid diamond walls. Live your life, be free! The Blue Mountains aren’t really blue either facty facterson. 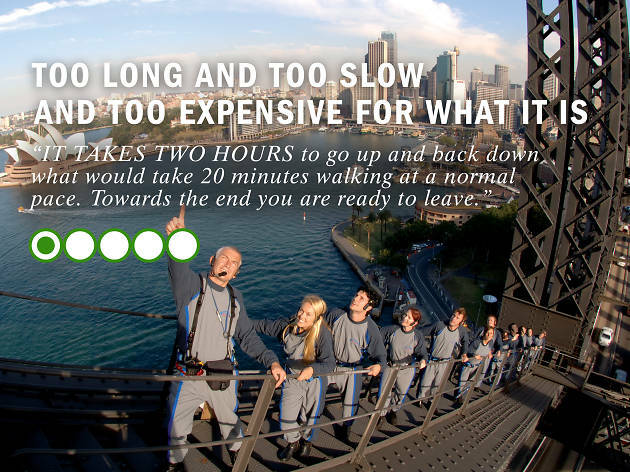 Would actually love to watch this reviewer power walk over the Harbour Bridge’s arch. Untethered and free, tiny weights in their hands, lurid Lycra mini-shorts, blonde perm wobbling in the breeze… wait that’s Kath Day-Knight. Look at her go! She’s reaching a personal best and reaching the peak of the Bridge at once. “Don’t be ridiculous, Kel the Bridge’s arch is 2.5 kilometres long, that’s the same distance as home to the Fountain Gate shopping centre, it should take less than 20 minutes,” you can hear her say as she is forced to plod safely up the climb. By the end of anything, we are all most certainly ready to leave, that’s why it’s called the end. 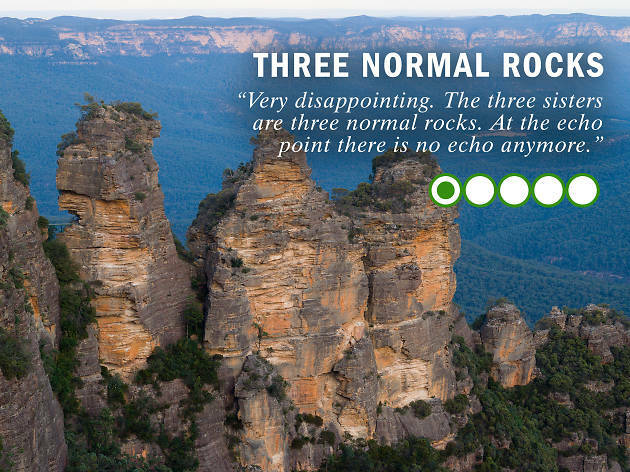 We can all relate to this reviewer’s plight. Once we were asked to leave the cinema because a movie started playing out of nowhere and in the middle of our conversation. Rude! Another time we were disgracefully booted from a food court because apparently “people” were “eating” and it wasn’t appropriate to run a DIY day care using the tables as playpens or filling the bins with used nappies, apparently it’s “illegal”. Rude! We’re also banned from using the Apple Store as a test kitchen for our MasterChef auditions. Rude! Sydney is rude. And dim! Again with the lights, Sydney, are you wasting all your bulb power at Vivid? Rude! We give up. The people have spoken. Just because they’re popular doesn’t make them tacky... 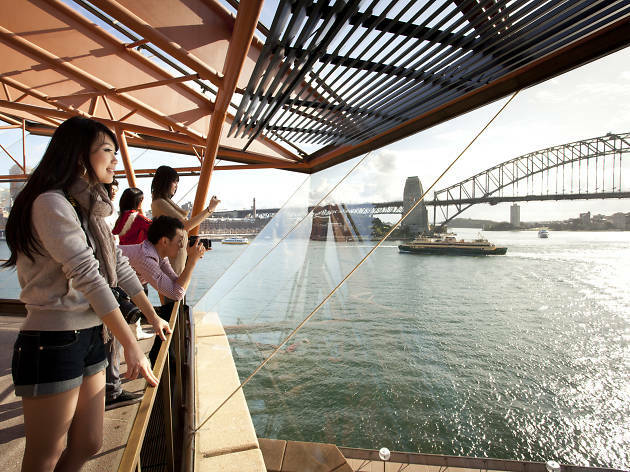 These tried-and-tested tourist attractions around Sydney range from thrill seeking adventures to scenic tours of our city's peaceful gardens and parks.